This entry was posted in Art In The Forest And Other Oddities, Musings, Wildlife At The Mill and tagged complaint department, humor, osprey, poop by foresterartist. Bookmark the permalink. Oh… I love this one!!! Osprey are magnificent birds. We get them here in Perth. I’m always excited when I see one. Its great having them outside my office. I get to check in on them every day! 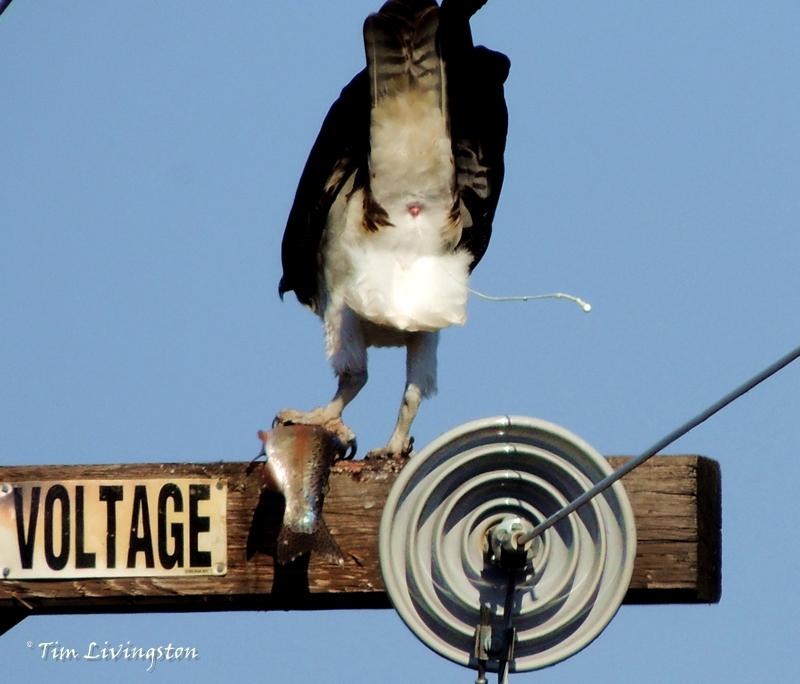 My favorite osprey tale is from Lee Valley Lake in the White Mts. of Arizona, a small impoundment stocked with Arctic Grayling. A fragile species in a tenuous environment, it was catch and release only for human fisherman as a pair of ospreys came and went the whole day, hauling dozens of grayling off to feed the nestlings. When I looked at this picture I had the same thought about a plasma arc. I am happy to report that the osprey discharged his duty without incident. As for the grayling, I guess someone needs to pass a law against osprey eating protected fish and give them a cease and desist order! What a funny shot! nice fisher fellow.. if I could I would bring him lot of fishes! You can go on and on with osprey posts Tim..
Lots of fish would make him happy indeed! We REALLY want to keep him happy. I’m glad I can continue the posts because I don’t want to complain. Nice shot! And nice shot. A double shot, oh ya! It’s all in the attitude…. Boy, do we have some attitude here! Attitude with altitude. Hey, I’m not smiling. The business end of that osprey was aimed at the photographer! Easy, I had an uncooperative model with a bad attitude. Absolutely amazing! I especially love that very casual posture, dinner in the left claws, first just have to… Fantastic! Please don’t stop your osprey reporting, it’s great, all of it! Thanks Gunilla, I’m so glad I don’t have to issue another complaint to the osprey. The last one didn’t go well as you can see. Oh ya, you should have seen the photographer after the picture! :0 Just kidding, he missed me. Very funny! I don’t think we have osprey around here, but we have many kinds of hawks. And twice we had bald eagles visit our lake briefly hoping to fish, I think. I don’t know if they caught any, but one did reduce the squirrel population slightly. They were reintroduced to Indiana years ago and are starting to spread away from the reservoir. Thanks Ruth, we too have see an increase in our Bald Eagle population. I never get tired of seeing them. You might see osprey in your neck of the woods sometime when they are migrating. They go north for breeding. Thanks for the kind word, we don’t want to upset to coordinator! Thanks, I’m sooo glad you didn’t complain! Complaints dept? I’m sure the head of it would be an osprey! And he’s quite good at it!